Testimation HomeAbout TestimationContact TestimationTestimation AccountsTestimation AdviceTestimation AppsTestimation CapabilityTestimation CertificationTestimation Cyber-UniversityTestimation FAQ'sTestimation FeaturesTestimation HelpTestimation PricingTestimation ServicesTestimation Admin. We provide independent certification services for individuals, corporations & products across all sectors. Trust takes years to build, seconds to break & forever to repair. 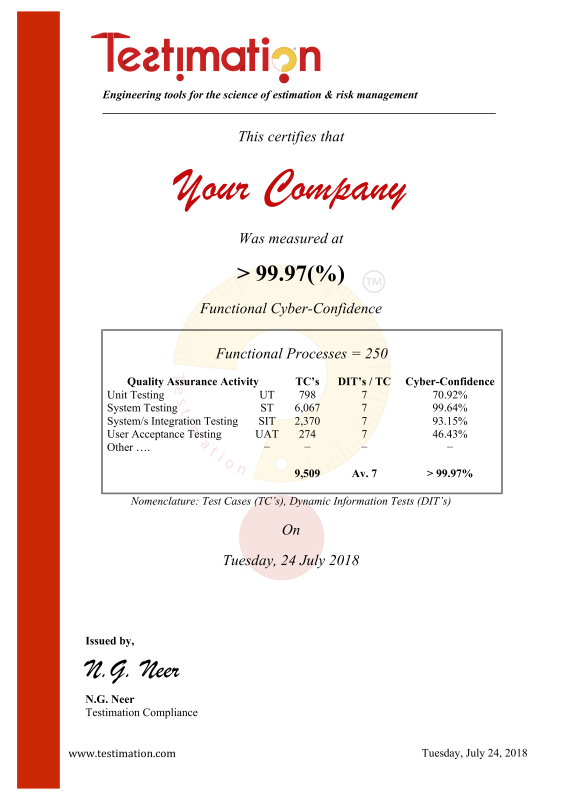 We can certify your Cyber-Risk, Cyber-Security or Product Development, so that your customers can take comfort in objective 3rd party appraisal of what you're delivering to them .... Certification speaks ! Right now in your organisation, you probably have great people doing great work; but do they know 'how much' they need to be doing ? How do YOU know you're doing enough ? How is it possible to know 'how much' is required (of anything) in the absence of measurement ? Our society simply could not function without measurement systems. All Science, Engineering & Financial Systems hinge on their use of measurement. Wihout measurement, you would not have a single artefact around you; no phone, no car, no house, no medication .... nothing. Cyber-Risk is about much more than just Cyber-Security or Hacking attempts. Cyber-Risk involves all forms of Undiscovered Defects; e.g. Failover, Functionality, Performance, Security, Stress Response etc. 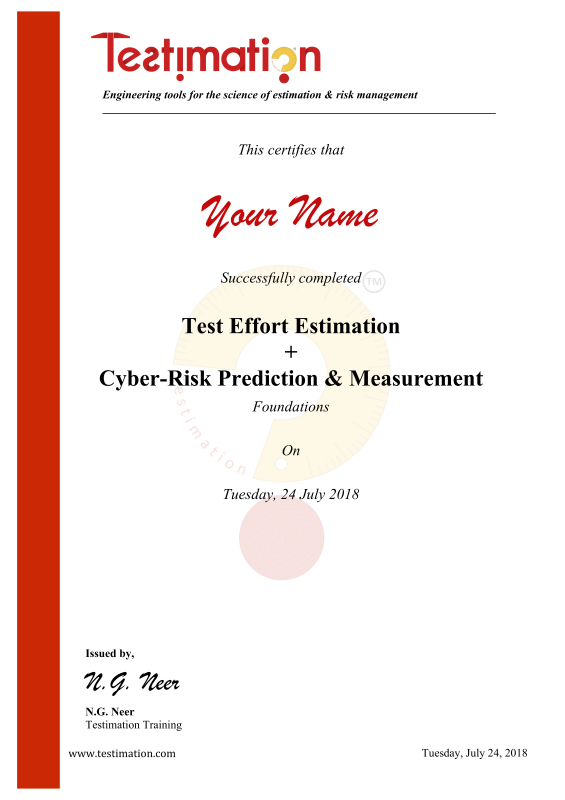 To understand Cyber-Risk, we must first measure our Cyber-Confidence; Cyber-Risk follows Cyber-Confidence, it never precedes it; you can't know the likelihood of failure until you first know the likelihood of success. 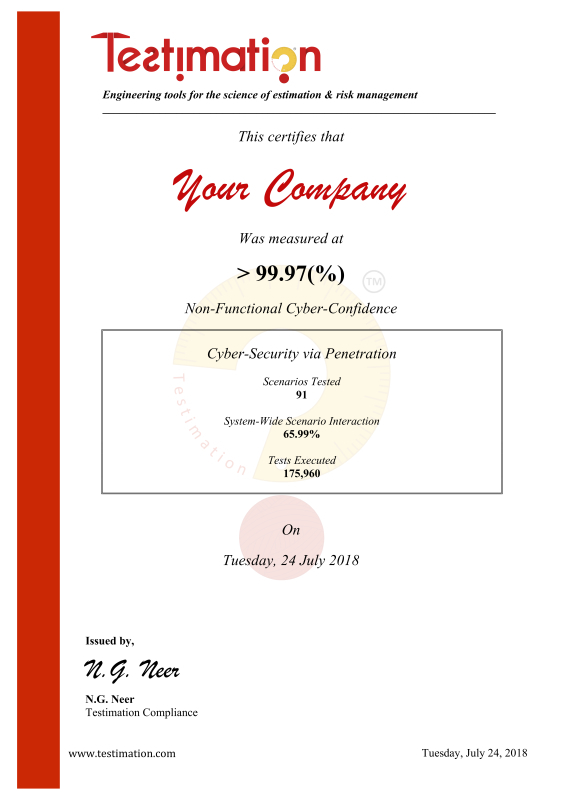 Cyber-Risk denotes the Testing which has NOT been executed. This includes tests for security workarounds which have not yet been discovered by the Hacking Community. In other words, a successful penetration event is simply a test that the victim has not yet executed; probably because the test has not yet been conceived or designed. Cyber-Security is typically reactive; closing the stable door after the horse has bolted. Testimation Technology allows users to measure the value of being proactive rather than reactive. Where would you expect most of your Cyber-Risk to be; System-Penetration perhaps ? This is an interesting question & the answer may not be what you might expect. You can use Testimation Technology to model & analyse your Business Cyber-Risk to answer this question. We engage with you to understand your product, what it does & its primary functions. With your cooperation, we define a system boundary around your product & determine the number of Functional Processes crossing the system boundary. We work with you to determine the number of components within your product. We work with you to determine the average number of required tests per component. We work with you to understand what additional product testing you have completed (or will complete). We analyse the information gathered utilising Testimation Technology & produce an engineering report. An engineering report is generated. A formal certification document is issued for your product. This electric motor performs one function. That is, its primary Functional Process is to convert electrical energy to rotational mechanical energy; in / out across the system boundary. The electric motor has 27 listed components. Let's imagine that each component undergoes (on average), 4 tests for compliance to its manufacturing specification (e.g. length, breadth, height, material, .... etc.). Let's also imagine that you do an additional 12 tests as part of your own internal manufacturing procedures; this brings the total number of tests to 120. 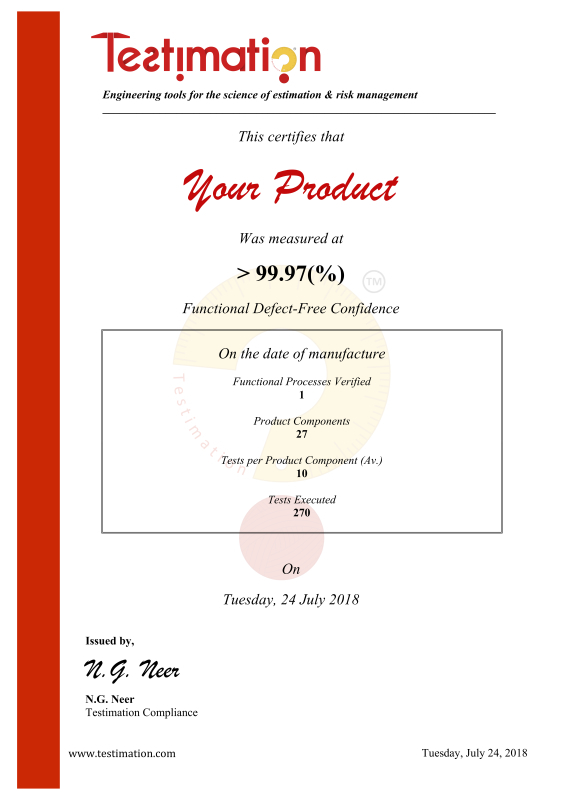 If we apply the value of 120 tests to compute the 'Functional Defect-Free Confidence' utilising Testimation Technology, it is certified to be 98.56(%) (on the day of manufacture / shipping). If you are purchasing components to assemble into your own product offering, it is not essential that you re-test the constinuent components supplied by others to their manufacturing specifications. However, you will need to obtain documentary evidence from the component manufacturers demonstrating that they have manufactured & shipped their products to you, in compliance with their own specifications. It is desireable to obtain as much specification compliance information from your component suppliers as possible.